At Jamnik d.o.o., we started the certification process for ISO standard 22000 in August 2018. This standard, which regulates food-safety, was first introduced in 2005 under the official name “Food Safety Management Systems”. 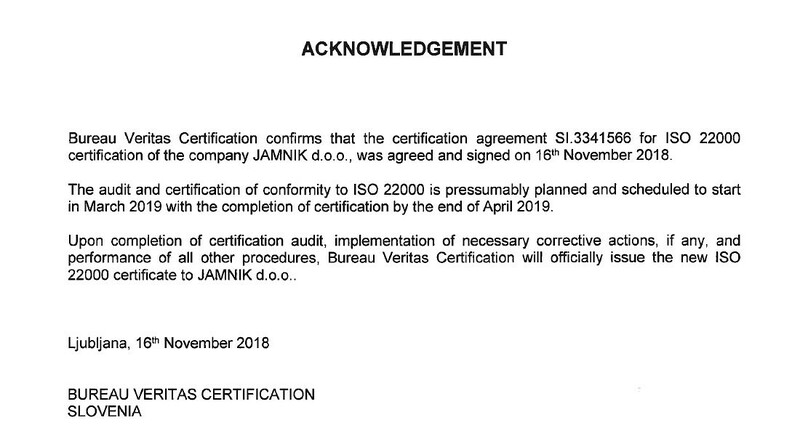 At Jamnik d.o.o., we started the certification process for ISO standard 22000 in August 2018. This standard, which regulates food-safety, was first introduced in 2005 under the official name “Food Safety Management Systems”. This year, a new, updated version was launched. The aim of the standard is to provide a system for monitoring and providing safety, and it is meant for all organizations in the food industry, from production, processing and logistics till packing into cardboard packaging, in short: for all materials and equipment that comes into contact with food. Our aim is to qualify for this standard by December 2018 and then becoming officially certified by the notified body in the beginning of 2019. Being certified by this standard is of pivotal importance to us, as by compliance to the requirements for a food safety management system given by ISO 22000 we prove the ability to manage risks in connection with the production and processing of food, and are thus able to guarantee the safety of our products.